We are excited to announce that now you can have greater control over your web API’s when you secure them using Azure AD B2C. 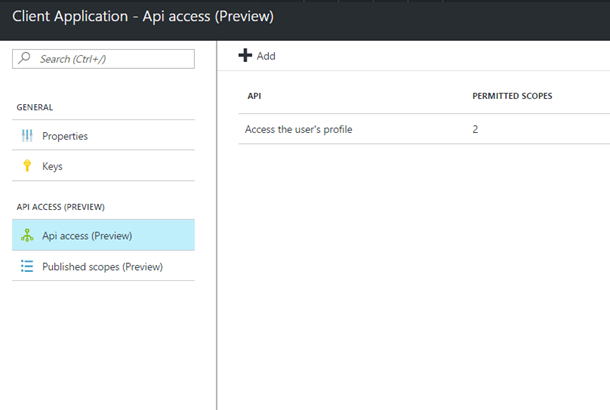 Today, we are enabling the public preview for using access tokens with your web API’s. This is a powerful feature that many of you have been asking for. The introduction of this feature makes it possible to create web API’s that can be accessed by different client applications. You can even grant permissions to your API on an app-to-app basis. By having more control over who can access your API, you will be able to develop apps with tighter security. 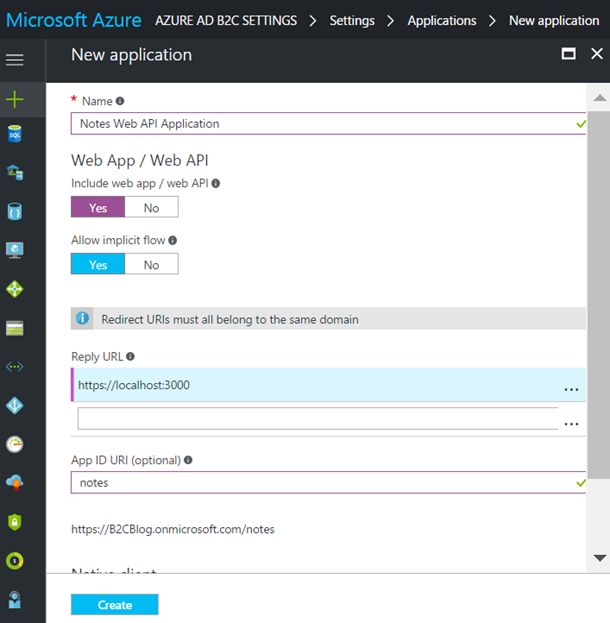 Go to the Azure AD B2C Settings blade in your Azure AD B2C tenant and add a new application. Give your application a name, set ‘Include web app / web API’ to ‘YES’, and enter a ‘Reply URL’ and an ‘App ID URI’. After creating your web API, click on the application, and then ‘Published scopes’. In this blade, you can add the scopes, or permissions, that a client application can request. The ‘user_impersonation’ permission is available by default. Inside the ‘Applications’ blade, register a new application. After creating it, select ‘Api access’. Click the ‘Add’ button. In the next blade, select the API and its permissions you would like to grant your client application. By default, applications are granted the ability to access the user's profile via the "openid” permission, and generate refresh tokens via the "offline_access" permission. These can be removed if you do not want your client application to have this functionality. Making a request to Azure AD B2C for an access token is similar to the way requests are made for id tokens. The main difference is the value entered in the “scope” parameter. 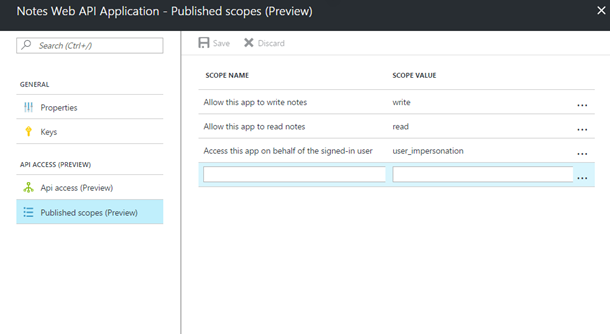 The “scope” parameter contains the specific resource and its permissions your app is requesting. 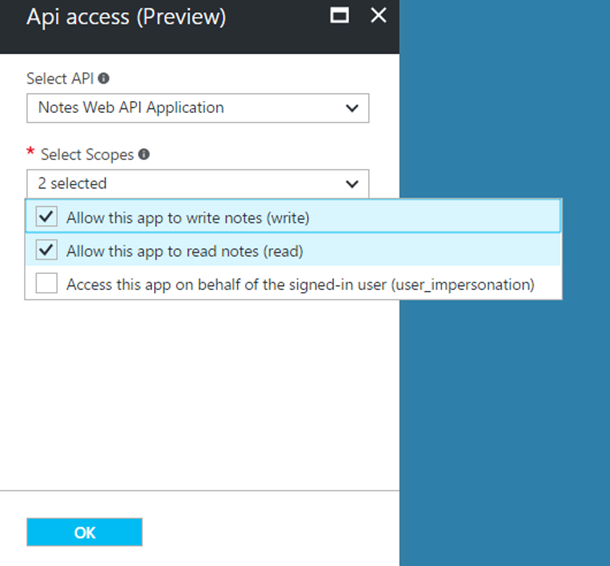 For example, to access the “read” permission for the resource application with an App ID URI of “https://B2CBlog.onmicrosoft.com/notes”, the scope in your request would be “https://B2CBlog.onmicrosoft.com/notes/read”. Below is an example of an authorization code request with the following scopes: “https://B2CBlog.onmicrosoft.com/notes/read”, “openid”, and “offline_access”. If you would like to learn more about this feature or try it out using our samples, please check out our documentation. Keep your great feedback coming on UserVoice and Twitter (@azuread). If you have questions, get help using Stack Overflow (use the ‘azure-ad-b2c’ tag).